Hello, Jackie here from Teal & Lime. One thing I have learned in my first 10 years of marriage is we will never agree on the ideal temperature for a room. He always likes it about 10 degrees colder than me…year round. Can you relate? In the winter, I cuddle up with my faux fur throw blankets. I have baskets and bins in every room to hold throws. The only downside I see to spring is putting my thick, cozy throw blankets away. Now with the ceiling fan constantly whirring overhead until late fall, I still get the chills. Remember, my hubby likes it 10 degrees cooler? He also likes a breeze. The cool splash of moving air against my skin gives me goosebumps, even in the warmer months. 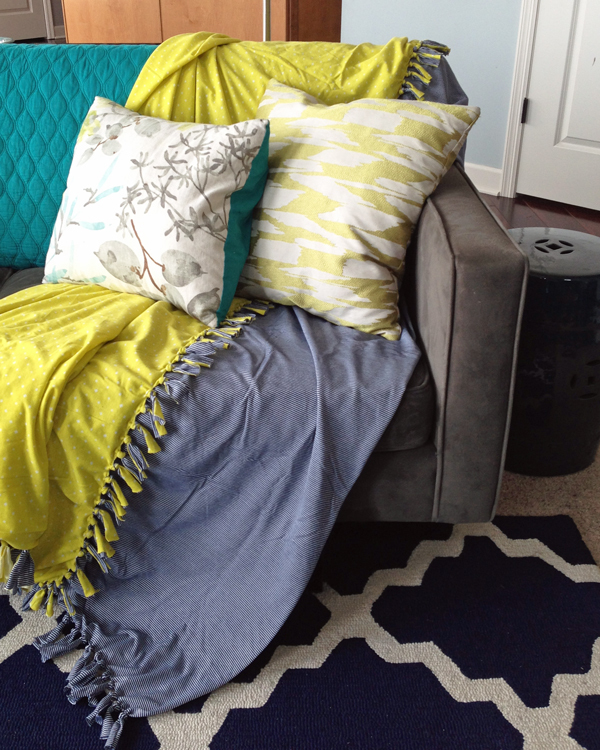 This spring I am swapping out my favorite winter throws with some colorful, lightweight throw blankets. They are just thick enough to keep away goosebumps. 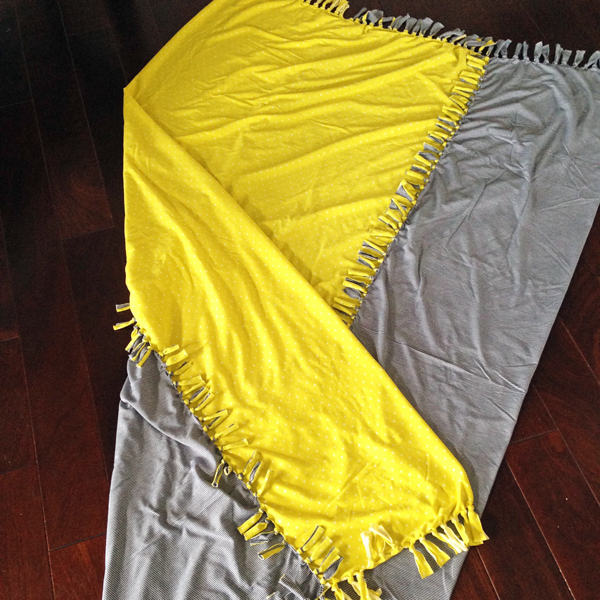 This lightweight throw blanket was inspired by the super warm tied fleece throw blankets. 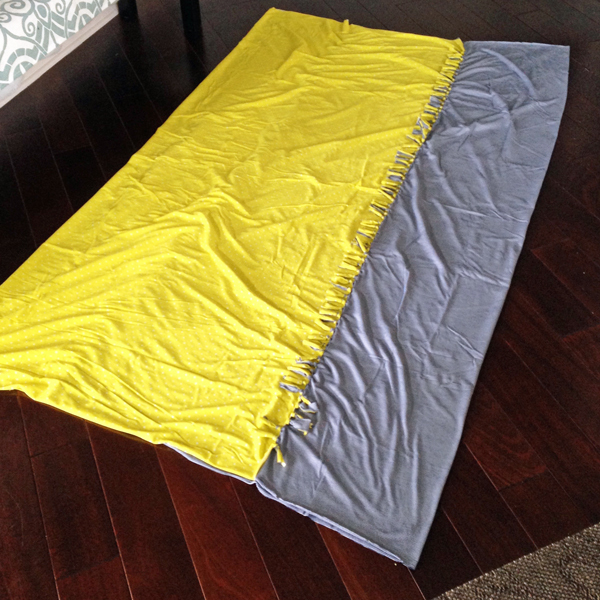 I love how easy it is to make the no-sew fleece blankets. To make them summer friendly, I used jersey fabric instead of fleece. Jersey is a knit fabric, like what t-shirts are made of. It doesn’t fray or unravel like regular cotton fabric. I used two jersey flat sheets from my linen closet to make this throw blanket. You can also buy jersey by the yard at the fabric store. 1. Cut two pieces of jersey fabric 4” larger around than you want your finished blanket size. 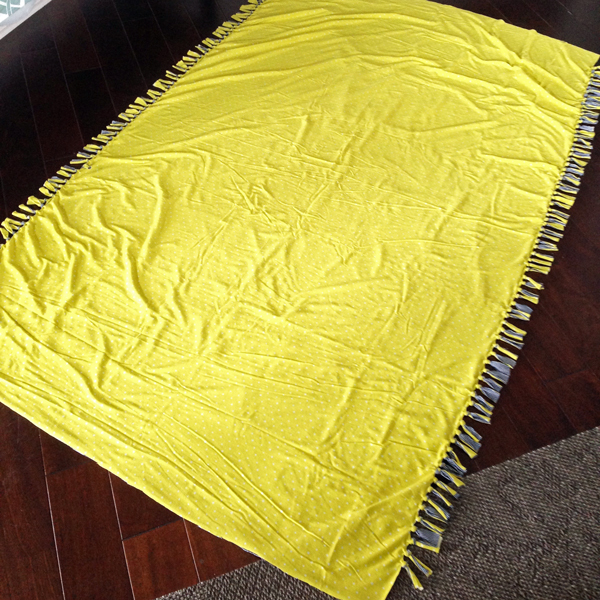 A common throw blanket size is 50 x 60”. I chose to use the full size of my flat twin sheets, minus the hemmed edges, for an extra long blanket. I chose two contrasting colors/patterns for my blanket. 2. Lay one piece of fabric right side down on the floor. Lay your second piece of fabric right side up on top of the first piece. The wrong-sides of the fabric will be together. 3. 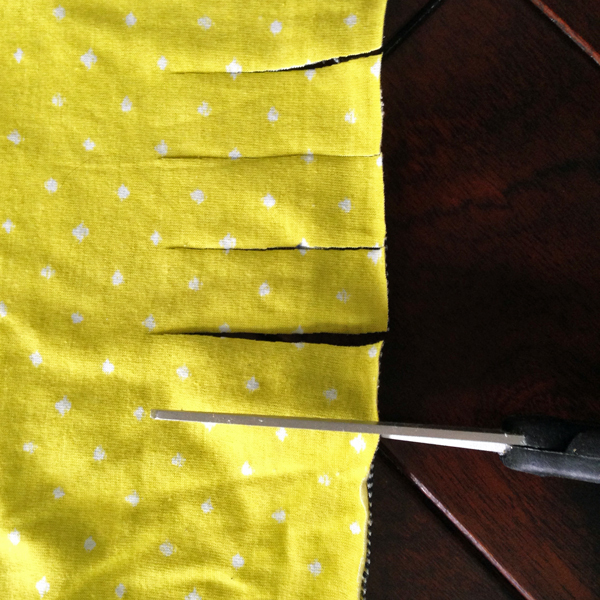 Trim the edges of your two pieces of fabric until they are even. 4. Cut a 4” square out of each corner through both thicknesses of fabric. There won’t be any ties in the corners. 5. 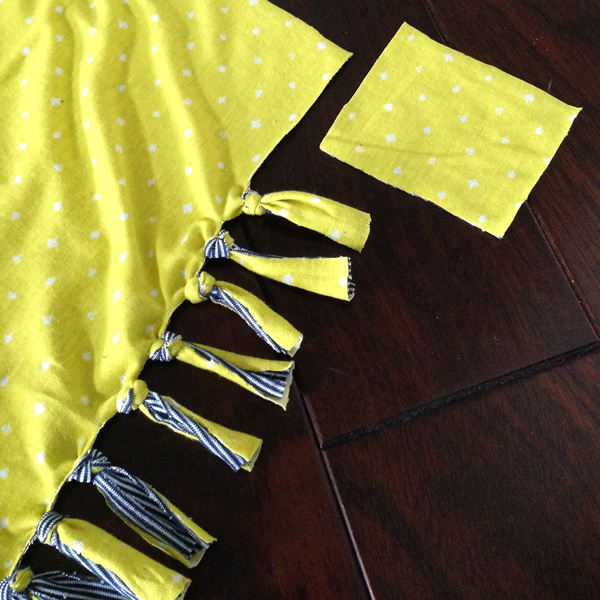 On the long sides of your blanket, cut 4” slits every 1” along the edge of the fabric (I eye-balled my cuts). Cut both layers at the same time. 6. Tie the two pieces of fabric together to create the fringe. 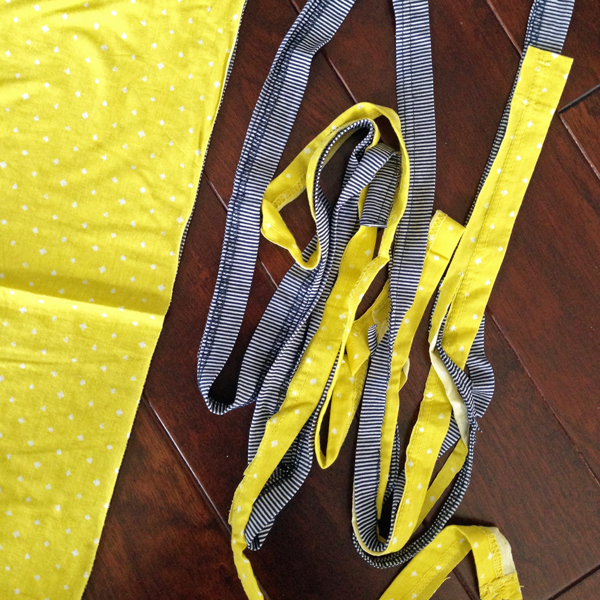 Use a balloon knot to join the fabric, like how you tie off a balloon. Once you have both sides tied, your blanket will be one big tube of fabric. 7. 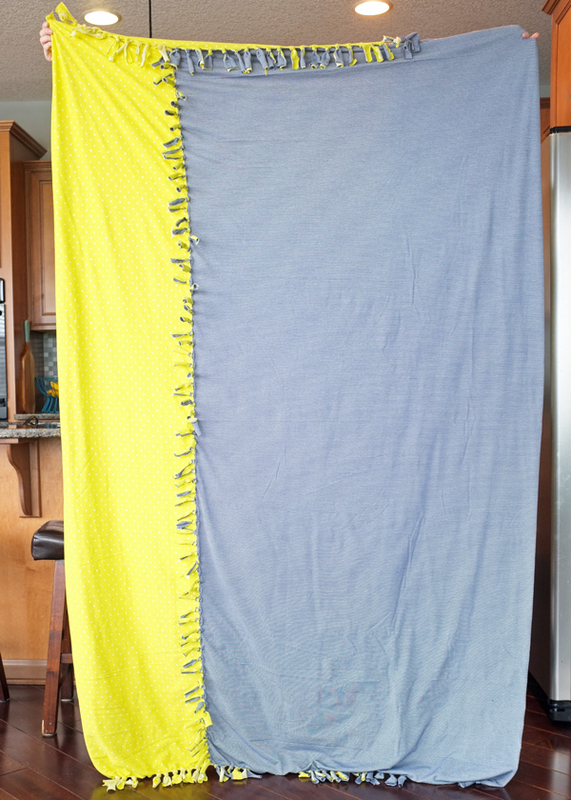 To create the color blocked effect, refold your blanket to position the tied fringe 1/3 of the way in from the edge. 8. After refolding the blanket and smoothing it back out, cut 4” slits every 1” along the short sides. 9. Tie the fringe on the short sides together using balloon knots. 10. Enjoy your new lightweight throw! I love the soft, smooth jersey fabric. 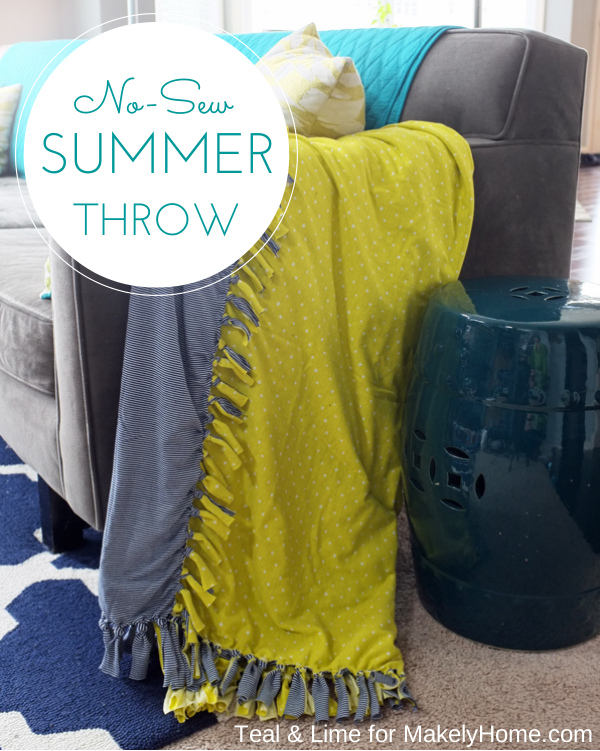 This is the perfect throw to slip under on a cool summer evening! Jackie Hernandez is the self-taught decorator behind Teal & Lime and the founder of School of Decorating. Jackie turned traditional decorating advice on it's head with her first course Define Your Style, which empowers everyday women (like you) to uncover their individual style so decorating becomes a breeze. You can find Jackie teaching her signature simple approach to creating a dream home in any home at School of Decorating (coming this fall). If you do not want to make it color block, just one color on each side. Do you just cut the slits on the short side. Do you still need to cut the 4 square in the corners? Will the corners be tied? I think this would feel so good in the warmer months. My husband keeps the house pretty cool as well and i don’t like to be cold 🙂 Thank You! Great explanation to make this! One question please, if I already bought a large fleece piece of fabric but DO want it lighter weight – can I use any “stretchy” fabric for the underside? Could a flat sheet even work? (cotton) I may not have stretchy fabric this large enough at home. I want a Queen size, so it’ll be BIG, but one side must be the fleece I already purchased……Thanks for any ideas! !